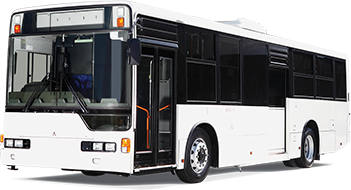 The MP300 makes passenger transport comfortable and convenient. Whether it’s the ultra-low floor of our City Bus or the customisable seating on our School Bus, our vehicles are designed to improve accessibility. 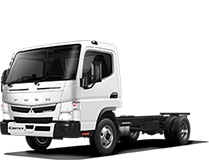 Best of all, enjoy peace of mind knowing you’re backed by Fuso’s national dealer network. 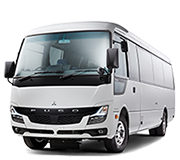 Only Japanese manufactured bus fully backed by a dedicated national network of commercial vehicle dealers (sales, service and parts). 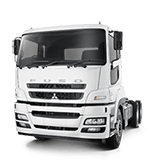 SCR (AdBlue)/DPF (diesel particulate filter) emission control technology. 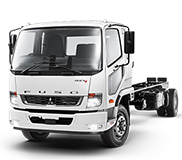 Already meets next round of ADR emission requirements to further future proof the vehicle. ISS (idle stop start) helps maximise fuel economy. 7.5 litre, 6-cylinder diesel engine with powertard and exhaust brake. 6-speed 3500 series Allison automatic transmission. Accelerator interlock and pre warning buzzer (helps prevent vehicle being driven with passenger access door open). Rear air-conditioning system with integrated roof vents located throughout cabin. Two model options - 32 seated/29 standing (61 total) or 34 seated/29 standing (63 total) including driver. Easy wheel chair access with integrated front fold out ramp. One wheelchair space on the 32 seat bus, two spaces on the 34 seat bus. Airbag front and rear suspension with kerb side kneeling function. Cloth finished factory fitted seats. Stop request buttons fitted throughout the bus. 11 rows with 46 seats or 12 rows with 50 seats including driver. Seats locally fitted allowing customisable fabric and layout design. 5 external under body storage bins.